Make Your First Quilt a Success! 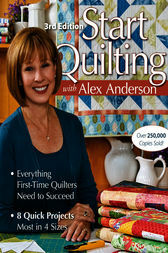 Alex guides you every step of the way as you learn to plan, cut, piece, quilt, and bind your quilt. Get started with 8 easy, beautiful projects. Expanded edition includes new projects, more quilt sizes, and lots of helpful new tips and shortcuts. So you want to make a quilt, but can't tell a rotary cutter from a seam ripper? Alex Anderson has helped a quarter million quilters learn to quilt. She'll get you quilting in no time-and loving it!